Monday’s 2018 World Series of Poker action saw two bracelets and a nice chunk of change awarded. Several other events also put Day 1s and Day 2s in the books, with some well-known chip leaders leading their fields. Here’s all the info you need to know from Monday June 4th. Fresh from his sixth-place finish in the Super High Roller Bowl (for $900K), Nick ‘caecilius’ Petrangelo hopped straight into Event #5: the $100,000 No Limit Hold’em High Roller. 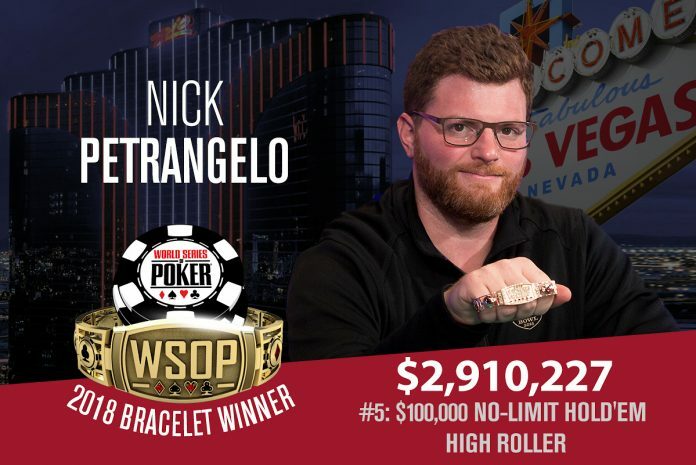 Four days later, Petrangelo has won his second WSOP bracelet and a massive score of $2,910,227. This win marks the biggest cash of Petrangelo’s illustrious career, one that has now seen him amass $14.6 million in career earnings including two bracelets. His first came back in 2015, when the Massachusetts-native took down the $3,000 NLHE SHOOTOUT for $201K. As you’d expect from such a big buy-in (which after 105 entrants created a $10,185,000 prize pool), this event had a stack field. But Petrangelo seemed to be cruising throughout, bagging the Day 2 and Day 3 chip lead before returning on Monday to face a six-handed final table containing Bryn Kenney, Stephen Chidwick, Elio Fox, Andreas Eiler, and Aymon Hata. The shorter stacks of Chidwick and Kenney were the first to fall, followed by Eiler who flopped trips only for Petrangelo to hit a full house. Hata then exited after his flopped top pair was ousted by a rivered straight for Petrangelo. Heads-up against Fox, who was looking for his second bracelet of the summer, the chip lead went back and forth. It would ultimately take a cooler to end it, after Fox flopped top two pair in a four-bet preflop pot, only for Petrangelo to turn a bigger two pair. All the money went in on the river, and Petrangelo was crowned the champ. The second bracelet to be handed out on Monday went to Johannes Becker, who entered Event #8: $2,500 Mixed Triple Draw Lowball after busting the $100K High Roller. It seemed like a good idea, as Becker specialises in high stakes online lowball games and has plenty of experience on the WSOP stage having finished second in last year’s $50K Poker Players Championship. 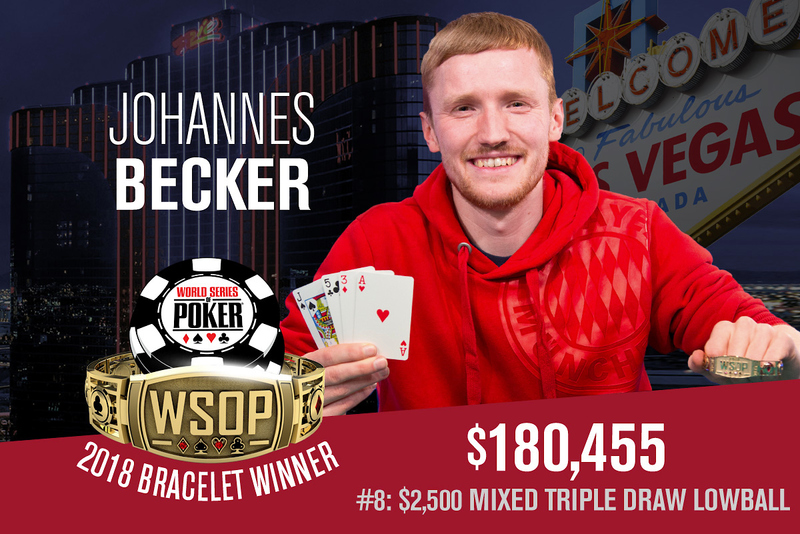 Three days later and that decision was well worth it, as Becker had taken the thing down for $180,455 and his first WSOP bracelet. He had to outlast a 321-strong field, and despite coming into the final with the second shortest stack, he’d eventually overcome a tough final table that included Scott Seiver, Jesse Hampton, Chris Vitch, George Trigeorgis, and Luis Velador. Three-handed, Becker once again found himself with the short stack. Seiver held a huge chip lead, but Becker forged a comeback that would see him eliminate Hampton in third before finally taking down Seiver heads-up in a Badugi hand. The 27-year-old from Cologne was already an established mixed game player, battling with the likes of ‘Crazy’ Elior Sion on a regular basis. Becker would lose heads-up to Sion in the $50K last year, but this tournament was Becker’s breakout tournament victory. Monday ended with a stacked line-up bagging up chips in Event #9, the $10,000 Omaha Hi-Lo 8 or Better Championship. This event got 169 total entries, 83 of which began Monday’s Day 2. When all was said and done just 22 players made it through, and its high stakes veteran and three-time bracelet winner Eli Elezra who tops the field with an 858,000 stack. He’ll be joined by the likes of Jesse Martin (479,000), Felipe Ramos (401,000), Mike Gorodinsky (385,000), Paul Volpe (372,000), Per Hildebrand (316,000), Robert Mizrachi (250,000), Dylan Linde (240,000), Mike Matusow (234,000), and Scott Bohlman (108,000). The $1,588,600 prize pool is split between the top 26 players, meaning Dan Shak, Stuart Rutter, and bracelet winners Anthony Zinno and Steven Wolansky have already cashed for $14,912. All 22 hopefuls are guaranteed that payout too. Throughout the day we lost some big names; heck, perhaps the biggest name. Phil Ivey late regged today but couldn’t survive, nor could Iraj Parvizi, Matthew Ashton, Chris Ferguson, Cary Katz, Jeffrey Lisandro, Marco Johnson, Carol Fuchs, Ian Johns, Jean-Robert Bellande, Esther Taylor, James Obst, Ralph Perry, Nick Schulman, Mark Gregorich, or Phil Hellmuth. Event #12: $1,500 Dealer’s Choice 6-Handed proved to be a very popular event today, with 406 players entering for the chance to choose between 20 different poker variants. After ten levels of play, 120 players survived and it was John Hennigan who bagged up the chip lead, boasting a stack of 89,800. Hennigan’s rush came late into the day when he flopped a set in a PLO hand got two streets of value. Hennigan is most clostly followed by Andrey Zhigalov (85,275), Xunen Zheng (69,950), Luke Saltus (61,875), Joey Couden (59,325), and Jeff Lisandro (58,025). Meanwhile, Craig Chait (50,825), David Funkhouser (50,825), Shirley Rosario (46,550), Chris Vitch (42,025), and Layne Flack (23,175) also made it through. The $548,100 prize pool will be split between the top 61 finishers, with a min-cash worth $2,263. That’s chump change compared with the $129,882 first-place prize though, which comes with a shiny new WSOP bracelet. Some of the names who tried and failed today include defending champion David Bach, and former winners Carol Fuchs and Larry Berg. Phil Hellmuth, Daniel Negreanu, Frank Kassela, Shaun Deeb, Shaun Buchanan, James Obst, and Jeff Madsen also perished. It was a long day for anyone following Event #7 $565 COLOSSUS No-Limit Hold’em. The final two starting flights, Day 1E and 1F, played through 18 30-minute levels with play in the former beginning at 10am and the latter going into the early morning hours. The event has received a total of 13,071 entries over the six starting flights, but only 539 will return for Tuesday’s Day 2. Kurt Jewell bagged the chip lead from 1E with 474,000, while Broutee Benshamin was top dog after 1F with 450,000.
Notable players to advance from today’s action include 12-time WSOP Circuit ring winner Valentin Vornicu (308,000) three-time bracelet winner David Bach (267,000), TK Miles (235,000), Daniel Weinman (114,000), Matt Stout (91,000), Matt Affleck (79,000), Kathy Liebert (73,000), Mike Commiso (390,000) and Tyler Patterson (238,000). Day 2 begins at 2pm Tuesday. There are two more events kicking off on Tuesday, making this the busiest day of the series so far in terms of events running simultaneously. Event #13: $1,500 No-Limit Hold’em begins at 11am. The low buy-in event is sure to attract big numbers, and interestingly it comes with a big blind ante structure, popular with the high rollers. Later in the day Event #14: $1,500 No-Limit 2-7 Lowball Draw will kick off at 3pm.